Bring 4 quarts of salted water to a boil in a large pot. Add broccoli and boil 3 minutes until tender/crisp. Remove broccoli and place immediately in an ice water bath to cool. Drain and set aside. Add pasta to the boiling water and cook according to package directions. Drain and let cool. In a large bowl add the oil, red wine vinegar, 1-1 1/2 teaspoons salt, garlic and Habanero Mango Aioli, whisk until combined. 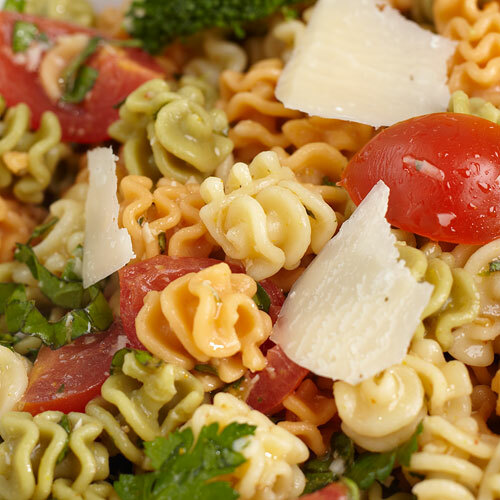 Add the cooled cooked pasta, basil, parsley tomatoes, Parmesan cheese and broccoli, toss. Add additional salt and pepper if needed. Serve cold or at room temperature.